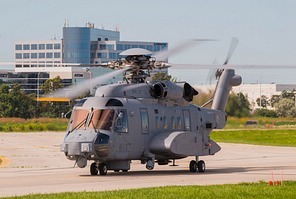 Ron Cembrowski tells us about the Royal Canadian Air Force's new stand of Colours presented in Toronto and presents images of the helicopters staging out of Buttonville Municipal Airport for the parade. On Friday, September 1, 2017 the Royal Canadian Air Force (RCAF) received their new Colours from Governor General David Johnston in a parade and ceremony at Nathan Philips Square, in front of Toronto City Hall. Colours are consecrated ceremonial flags carried by military units. During the ceremonial presentation, the Colours are consecrated by the Canadian Armed Forces Chaplain General assisted by unit chaplains. Colours serve as symbols of honour and duty. The RCAF carries a "stand" of Colours, which consists of two flags. 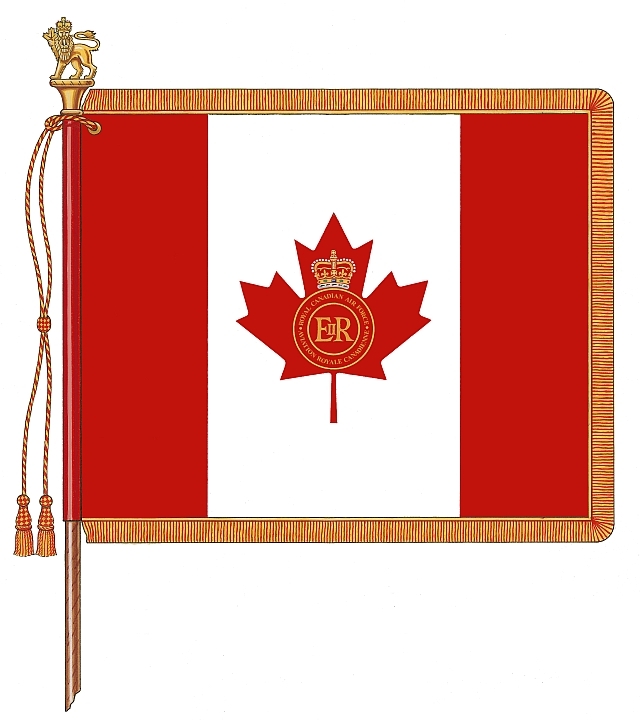 One is the Queen’s Colour, a Maple Leaf flag with the Sovereign’s cypher in the centre and the other a Command Colour, a blue flag with the RCAF’s badge at the centre. The new Queen's Colour now carries the historic name "Royal Canadian Air Force", in both English and French. 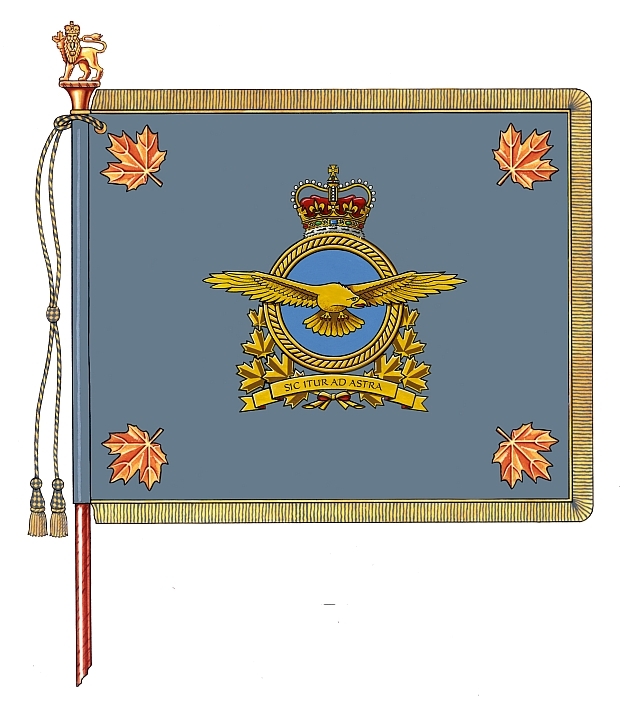 The new Command Colour carries the new badge of the RCAF, which was created following the restoration of the RCAF's historic name in 2011. It includes the RCAF’s motto SIC ITUR AD ASTRA ( "Such is the pathway to the stars"). This is the RCAF's third "stand" of Colours. The RCAF has received Colours only twice before in its 93 year history (1924 - 2017). The first was in 1950 from Governor General Alexander of Tunis and the second was in 1982 from Governor General Ed Schreyer. The Mayor of the City of Toronto, John Tory, who was in attendance at the ceremony, proclaimed Friday, September 1, 2017 "Royal Canadian Air Force Day" in the City of Toronto. "The City of Toronto acknowledges the bravery, courage and sacrifices of all Canadian veterans who fought for the peace and freedom we enjoy today. We shall continue to honour those who have served and those who continue to serve, as we remain vigilant in our quest for peace around the world." The Toronto City Hall lights, the 'TORONTO' sign in Nathan Phillips Square, and the CN Tower were illuminated in the colour of RCAF Blue. Toronto has a long history with the RCAF, beginning 100 years ago in January 1917, with the establishment of the Royal Flying Corps Canada headquarters. Its purpose was to recruit and train Canadian aircrew for service overseas during the First World War. Although Camp Borden, Ontario, was the main pilot training location during the First World War, the first flights took place at the University of Toronto, Long Branch and Leaside airfields. During the Second World War Toronto had a large role in the RCAF’s growth by hosting a number of British Commonwealth Air Training Plan schools, headquarters, research facilities, and recruiting establishments. This included the first training depot for the RCAF Women's Division established at Havergal College in Toronto. The first squadron sent overseas was No.110 "City of Toronto" (Army Cooperation) Squadron, in February 1940. On March 1, 1941, the squadron became No.400 Squadron, one of the first 400-block squadrons formed under the British Commonwealth Air Training Plan. At approximately 12:30pm the RCAF Colours Ceremony commenced at Nathan Philips Square. About 200 RCAF personnel, with more than 100 men and woman from 16 Wing, Canadian Forces Base Borden, Ontario, paraded the Colours in the square.
" To the men and women of the Royal Canadian Air Force: Our Colours – these physical objects on parade today – embody the ideals of bravery, honour, duty, and esprit de corps. They symbolize our history, our pride, and our service to Crown and Country. To the people of this great city of Toronto: you may be wondering why we are holding this most solemn and special of ceremonies here in Toronto. It’s very simple. This is where Canadian military aviation began." The Colours were presented by his Excellency the Right Honourable David Johnston, Governor General and Commander-in-Chief of Canada. This event is one of his final appearances in the role of Governor General as he will step down at the end of September.
" The history of our Air Force is one of pride, duty and honour. For more than 90 years, you have served us in many diverse ways. You serve in combat missions, but you also rescue people in danger and shore up community support during times of crises. You are peacekeepers. You protect our sovereignty. You are our eyes and ears in the sky." "Each of you has answered the call to service. Each of you has displayed values of duty and honour and courage. The individuals who serve in the Royal Canadian Air Force are an important part of our history and our society. And I’m pleased to recognize all that you do with this presentation of colours. Thank you, once again, for your service." A “parade in the sky” coincided with the ceremony demonstrating past and present air force capabilities, beginning at approximately 1:15pm with three Second World War era aircraft from the Canadian Warplane Heritage Museum (CWH), in Hamilton, Ontario, and Vintage Wings of Canada, in Gatineau, Quebec, followed at approximately 2:00pm by 26 aircraft from the current RCAF fleet. The aircraft flew over Queen Street, from east to west, at a height of 1500 feet (500 feet above the tallest officer tower, First Canadian Place - BMO headquarters, Canada's tallest skyscraper). The Avro "Mynarski Memorial' Lancaster Mk.X (C-GVRA) wearing the temporary 'Ruhr Express' markings as Canada's first built Lancaster (serial: KB700), was scheduled to be part of the fly past. Unfortunately, due to an engine maintenance issue the Lancaster was not available. The CWH sent their DC-3 Dakota (C-GDAK) in its place. The DC-3 is painted in the markings of 435 and 436 Squadrons which operated in Burma, during 1944 - 1945 and whose slogan was "Canucks Unlimited". The Vintage Wings of Canada FG-1D Corsair was also scheduled for the flypast but did not appear. The aircraft participating in the flypast staged from multiple bases. The warbirds flew out of the CWH Museum located at John C. Munro Hamilton International Airport (CYHM). Four of the five RCAF helicopters flew out of Buttonville Municipal Airport (CYKZ). The Snowbirds and the CF-188 'Canada 150" Demonstration Hornet flew out of Toronto Pearson International Airport (CYYZ) and the remaining fixed-wing RCAF aircraft flew out of 8 Wing, CFB Trenton. The airport is located 29 km north of downtown Toronto. The photos were shot from outside the airport fence. Departures were taken from the east side of the airport, near the main taxiway parallel to Rwy 15-33. Post-ceremony returning arrivals were taken at the south-west end of the airport, at the approach to Rwy 33. Only the CH-146, CH-147 and the CH-124 returned after the ceremony flypast. Unfortunately, the CH-148 Cyclone did not. 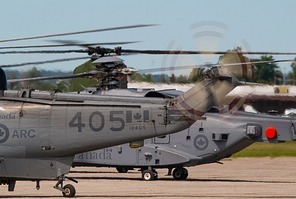 This was one of the first public appearances of the RCAF's new and long awaited maritime helicopter the CH-148 Cyclone. 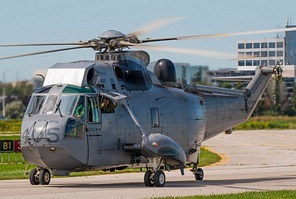 It is the replacement aircraft for the CH-124 Sea King. The Cyclone is a twin-engine shipborne maritime military variant of the Sikorsky S-92 / H-92 Superhawk. The Cyclone is designed to conduct anti-submarine and surface warfare as well as utility, and search and rescue missions. It carries a crew of four; two pilots, one tactical operator and one sensor operator. The Cyclone has a day-and-night flight capability, and can fly in most weather conditions in temperatures ranging from -51°C to +49°C. The aircraft will be capable of carrying two Mk 46 torpedoes as well as door and ramp mounted general purpose machine guns. With a maximum cruise speed of 250 km/h, the CH-148 Cyclone is approximately 10% faster than a Sea King and can fly 450 km without refuelling. 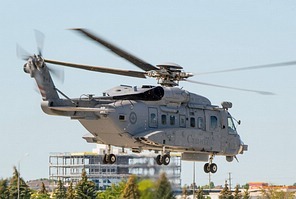 The Government of Canada has ordered 28 CH-148 Cyclone helicopters. In March 2017 Canada accepted its 11th Cyclone. The Maritime Helicopter Project is a phased approach for the gradual introduction of aircraft capabilities. At time of writing, the CH-148 Cyclone is still in the operational test and evaluation phase of its implementation. Initial operational capability is scheduled for 2018. The Sea King was initially ordered in 1962 as a replacement for the Sikorsky HO4S (model S-55). The first aircraft (s/n: 4001) was Taken on Charge on May 24, 1963. All told 41 Sea Kings were ordered, with deliveries occurring from May 1963 to March 1969. The first four aircraft were produced by Sikorsky at its Stratford, Connecticut plant. The remaining 37 were built by United Aircraft of Canada (Pratt & Whitney Canada) in Montreal. The Sea King was redesignated the CH-124 in July 1970 and reserialled in August 1970, using the prefix 124 and the last two numbers of the original serial. The CH-124 Sea King appearing at the Colours Presentation Flypast was the first Sea King built in Canada (serial number: 4005, manufacturers number 61-202) and was Taken on Charge by the Royal Canadian Navy on May 15, 1964. The CH-124 Sea King fleet is scheduled to be retired, at a ceremony at the 443 Maritime Helicopter Squadron location in Victoria, BC, in November 2018. The Sea Kings will have been in service for 55 years when they are finally retired (1963 - 2018).